Unquestionably one of the foremost names in “old-time” music during the 1920s, as well as one of the leading figures in the development of what would become “country music” is the original North Carolina Rambler: Charlie Poole. Charlie Clay Poole hailed from Randolph County, North Carolina, in the town of Franklinville, where he was born on March 22, 1892, the son of an Irish immigrant. As did his parents before him, Charlie went to work in a textile mill, but his real interest was in making music. Unable to afford a proper instrument, he fashioned his first banjo out of a gourd. As the result of a childhood incident in which he bet friends that he could catch a baseball without wearing a mitt, he learned to play the instrument in a unique three-fingered style of picking. In addition to his musical proclivities, Poole also had a reputation as a rounder and hell raiser supreme. After years toiling away his youth in the mill, Poole saved up enough money to purchase a Gibson banjo, then quit his job to pursue a career as a musician. Joined by his brother-in-law Posey Rorer, who played fiddle, and a host of other local musicians, he entertained at local functions. With the addition of guitarist Norman Woodlieff, the trio traveled to New York City in July of 1925 to make their first records for Columbia as the “North Carolina Ramblers”, producing four sides for which they received seventy-five dollars pay. Their first record turned out to be a hit, and Poole, along with Gid Tanner’s Skillet Lickers, helped to make Columbia into a powerhouse of old-time music in the genre’s earliest years on record, and he was one of the best-selling artists in their “Old Familiar Tunes” series. Thereafter, the North Carolina Ramblers returned to New York once a year—twice in 1930—to make further records, with two excursions to Paramount and Brunswick on the side, ultimately resulting in a total of eighty sides cut, of which all but ten were released. Membership within the band changed as years passed; Woodlieff was replaced with former railroad engineer Roy Harvey, and Lonnie Austin and Odell Smith came to take Rorer’s place, but Charlie Poole always remained constant as the North Carolina Ramblers’ nucleus and main attraction (though members of the group did make several records without him). Aside from recording, the North Carolina Ramblers also toured Vaudeville and appeared on radio around the Appalachian region. After his last recording session, Poole and band were invited to Hollywood to provide music for a Western movie in 1931. Unfortunately, before leaving for the west, Poole suffered a heart attack and died at the age of thirty-nine on May 21, 1931. Columbia 15038-D was recorded on July 27, 1925 in New York, New York. Sales figures have been reported as an astounding 102,451 copies. It is Charlie Poole’s first released record, consisting of his third and fourth recorded sides. The North Carolina Ramblers are Posey Rorer on fiddle, Norman Woodlieff on guitar, and of course Poole on the banjo. First, Poole sings what could probably be considered the definitive recording of the old folk song “Can I Sleep In Your Barn Tonight Mister”. 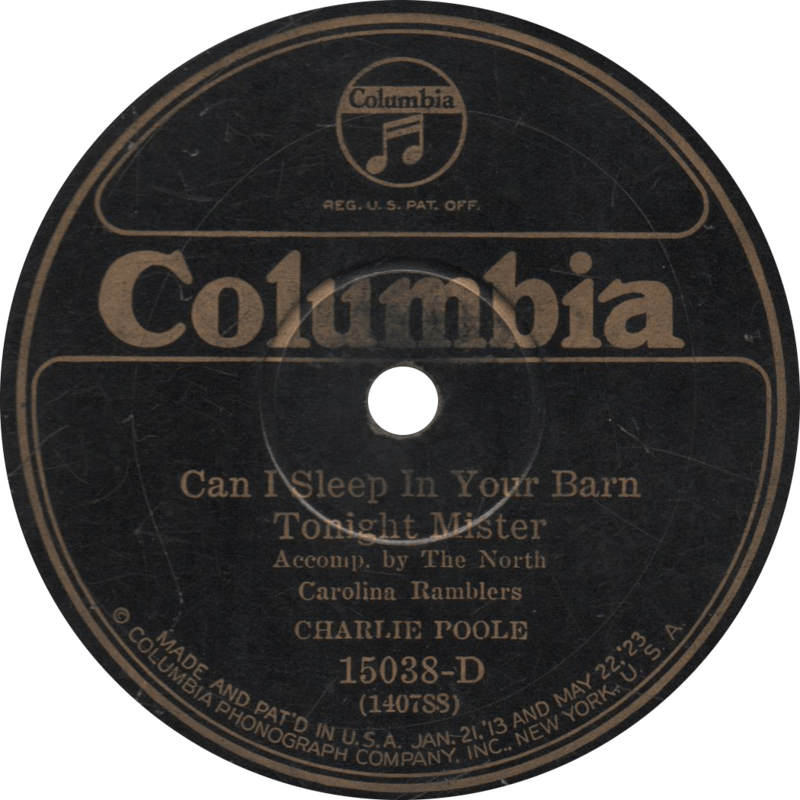 Can I Sleep in Your Barn Tonight Mister, recorded July 27, 1925 by Charlie Poole Accomp. by The North Carolina Ramblers. On the reverse, they play the classic “Don’t Let Your Deal Go Down Blues”—my personal favorite of the North Carolina Ramblers’ recordings—referring to the card game called “Georgia skin”, a game of chance popular in the South in those days, both for playing and singing about. 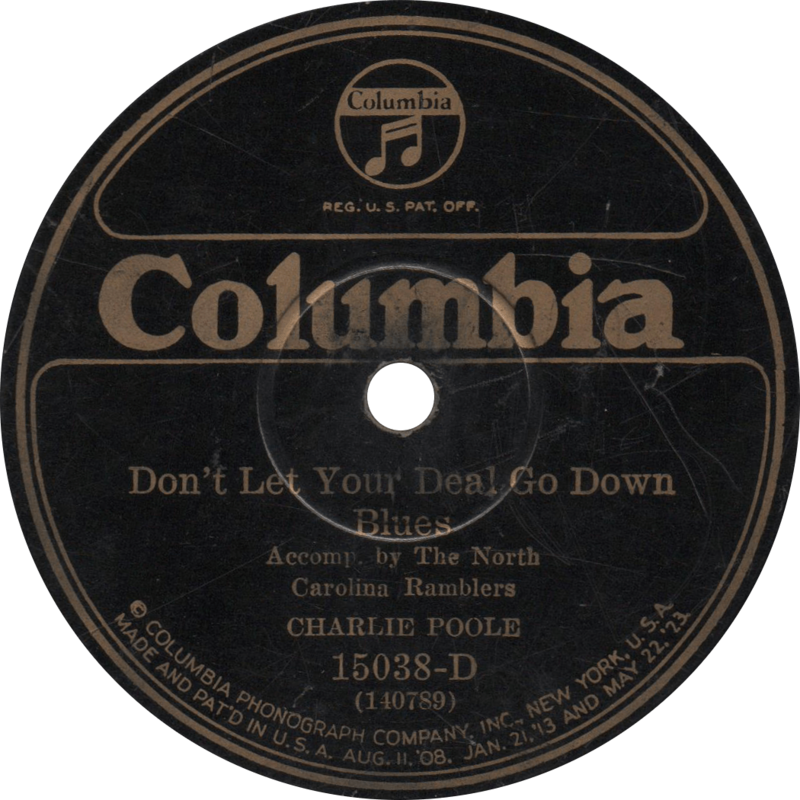 Don’t Let Your Deal Go Down Blues, recorded July 27, 1925 by Charlie Poole Accomp. by The North Carolina Ramblers. This entry was posted in Records and tagged 1920s, 1925, Charlie Poole, Columbia, Hillbilly, New York, Norman Woodlieff, Old Time, Posey Rorer by R. Connor Montgomery. Bookmark the permalink.